At SYMG we specialize in planning and executing incredible Yosemite and High Sierra Backpacking Adventures. 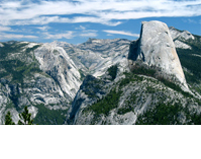 From three day Half Dome Trips to expedition style John Muir Trail Adventures, we can do it all, and have since 1991. Our professional guides are renowned for their amazing backcountry cuisine, and add color to the experience through natural and cultural history interpretation. In addition to the trips listed below that anyone may join, we can also organize private departures of any of our trips, or even create a custom trip just for you. Browse our trip list below to learn more about the many trips and tours offered by Southern Yosemite Mountain Guides and feel free to call us for custom trip options at 800-231-4575. 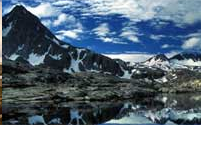 Outside Magazine rated hiking the John Muir Trail (JMT) with SYMG as one of the 50 greatest trips in the world. It spans 212 miles from Yosemite National Park to Mt. Whitney along the crest of the famed Sierra Nevada. Mules hike in 4 re-supplies of food during the journey, making the pack weight manageable each section. The JMT is, for many, a lifelong goal and accomplishment. Begin planning early as permits are very limited for this adventure. We lead the John Muir Trail hiking trips in both directions from Yosemite to Mt Whitney and Mt Whitney to Yosemite Valley. 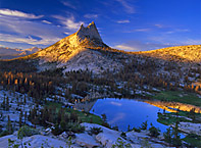 The John Muir Trail is one of the most famous trails in the world. It follows the rugged spine of the Sierra Nevada, passing by pristine alpine lakes, wildflower-strewn meadows and hulking glaciated peaks. This section will take us northward from Florence Lake to Yosemite Valley, tackling the imposing Selden, Silver and Donahue Passes, visiting Cathedral Lakes, and continuing to the Northern Terminus of the JMT: Yosemite Valley. The JMT Northbound takes you backpacking through what the guides call “Postcard Country” among the sparkling lakes beneath the imposing Ritter Range. This backpack trip has garnered much attention from the press and guests alike. With highlights including an ascent of Cloud's Rest, a section of the John Muir Trail, camp at the iconic Cathedral Lake and a nearly 60-mile hiking traverse through the remote heart of Yosemite it just may be the perfect week-long backpacking trip. The John Muir Trail is one of the most classic trails in the world and what better way to experience it than with “The Best Outfitter On Earth!” On this classic week long backpacking trip we’ll navigate the accessible Rae Lakes Loop through the wilderness of King’s Canyon National Park. Along the way we’ll tackle the JMT’s famous Glen Pass (11,978’) and camp in the Rae Lakes Basin beneath the Painted Lady and Fin Dome. This moderately challenging route has huge payoffs, getting you deep into the heart of California’s superlative Sierra Nevada. A grand crossing of the Sierra Nevada through Sequoia Nat'l Park, culminating in an ascent of Mt. Whitney from the west, coupled with dramatic hiking deep in the wilderness makes this backpacking trip one of our most spectacular adventures. This 83-mile Trans-Sierra crossing takes us through the most remote spots of the High Sierra. You'll climb Mt. Whitney from a direction that hikers seldomly see. Our travels take us on 3 famous trails: The John Muir Trail, The High Sierra Trail, and we exit the wilderness on the Pacific Crest Trail. The Red Peak Pass Loop is a 52-mile route through the heart of Yosemite. It spends equal time the most remote and also most iconic regions of the park. Highlights include the rugged Red Peak Pass, hiking alongside the cascading "Wild and Scenic" Merced River, and a lakeside camp beneath the ice fields of the stunning Ottoway Lakes Basin. Expect challenging days, incredible scenery, and memories that will last a lifetime. The high-country lakes, peaks, and passes of Yosemite are truly spectacular and on this 50 mile loop we'll hike deep into the heart of this alpine environment. We'll travel mostly on trail while topping out over 4 high mountain passes -including Red Peak Pass at 11,180', the highest trail pass in Yosemite. Enjoying astounding views of Yosemite and the High Sierra in some of the least visited areas of the park make this trip yet another SYMG classic. Remote timberline lakes, spectacular views of the Sierra Crest, and an itinerary geared towards exploration of this seemingly untouched landscape all create an ideal setting for our most popular backpacking trip. 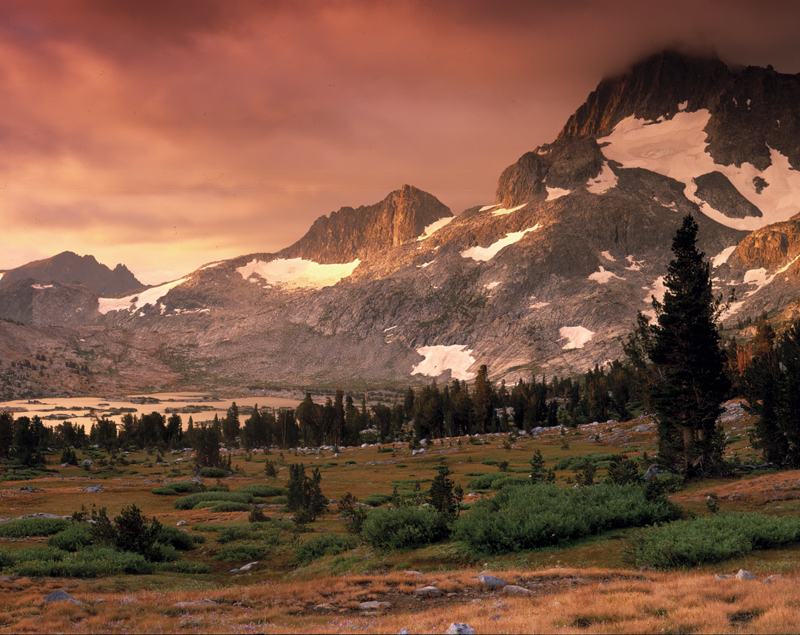 Hike through the pristine high lakes basins of the Ansel Adams Wilderness, and there's even an option to summit one of the 10,000+ft peaks of Yosemite's Merced Range. Lot of "bang for the buck," on this short trip, spending 3 days backpacking Yosemite Valley's North Rim. This is a wonderfully scenic trip with moderate days and highlights including hiking alongside the highest waterfall in North America (Yosemite Falls-2,425') and some of the best views of Yosemite Valley and Half Dome in the entire Park. On this long-weekend style adventure we'll backpack from Yosemite Valley along the Merced River towards the summit of Half Dome. Along the way, we'll hike up the famous Mist Trail, camp in picturesque Little Yosemite Valley and travel a section of the iconic and historic John Muir Trail. After a night spent in scenic Yosemite Valley, we'll set off from the Tuolumne highcountry with our eyes toward the iconic summits of Clouds Rest (9,926') and Half Dome (8,836'). Along the way, we'll hike a section of the famous and historic John Muir Trail past two of the world's most iconic waterfalls back into Yosemite Valley. 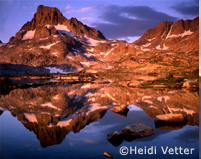 Journey into the spectacular sub-alpine lakes basins of the Ansel Adams Wilderness. With only 4 miles of backpacking to basecamp, this trip offers quick access to the high country, followed by several options for enjoying the rest of the trip: climbing a 10,000+ foot peak, touring the upper basin, or relaxing at the lake are all possible options. 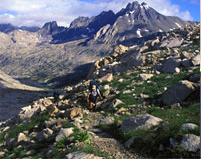 National Geographic Adventure Magazine chose the Sierra High Route as one the Best New Trips for 2010 in their October issue. SYMG is the first company to offer a guided departure on the 195-mile extreme trek from Southern Kings Canyon to Northern Yosemite. The Sierra High Route is an official name for an unofficial "route" that runs mostly above timberline through the heart of the High Sierra. It is rumored that more people attempt and climb Mt Everest each year than attempt and complete the Sierra High Route.